Chinese roast pork (Shao Rou 燒肉) is quite different in taste from the western one, although both have crackling skin on with tender meat under. 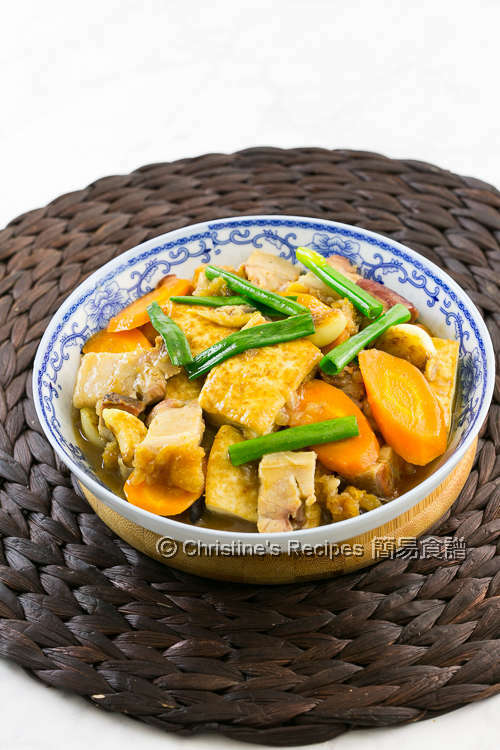 I’d like to reserve some to cook this classic Hong Kong dish, Braised Tofu with Roast Pork that is one of our family’s favourite. Although the pork skin would be no longer crispy but the taste of it remains as yummy as it comes out fresh from oven. It goes really well with tofu. The dish is wonderful on a bed of Jasmine rice. Cut each piece of tofu into 2 to 3 slices. Wipe dry with kitchen towels. Season with salt on both sides. Set aside. Heat a pan over medium heat. Don’t need to add oil. Cook roast pork and stir occasionally, until the oil releases. Set aside. Pan fry the tofu until both sides are brown. Set aside. Saute garlic over medium-low heat until lightly brown. Add shredded ginger, shallot, ground bean sauce. Saute until aromatic. Increase heat to medium high. Toss back the roast pork. Add carrot. Sprinkle wine. Add the fried tofu.Pour in water. When it boils, reduce heat to medium-low. Cover and cook until roast pork is softened. Add the seasonings. Add the thickening and cook to your preferred consistency. Garnish with spring onion. Serve immediately. 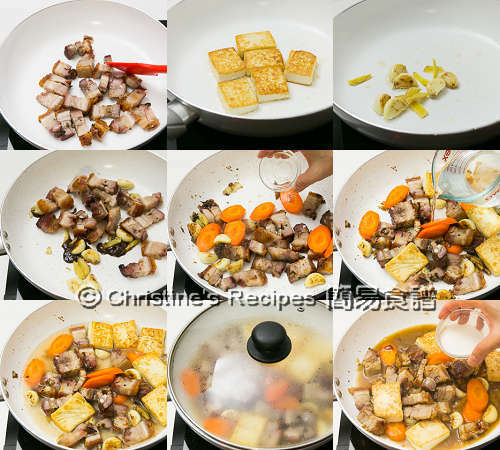 Before adding the thickening, taste it and adjust with light soy sauce if necessary. The saltiness of roast pork you use every time is different. As the power of every stove is different, you may need to add some boiling water if the water dries up while braising. I used soft tofu as I like its soft and smooth texture. It takes a bit more of care while pan-frying though. You can use hard tofu instead if you like. Wow, this dish looks so good. Makes my mouth waters. So long have not cooked tofu. I can imagine it with Chinese mushrooms. Just finished dinner, having this dish again. Gosh, really like the tofu with sauce. My mom used to make this dish for us esp during CNY when the Chinese leeks are in season. This dish goes well with a bowl of rice. Yummy! Yeah, Chinese leeks would add more flavour. My dad liked this dish very much. He'd always order one in Chinese restaurants for lunch. Wow, this looks amazing. Great use of leftover roast pork! I used to stir fry leftover roast pork with sugar, dark soy sauce and garlic and eat with porridge. What a yummy looking dish, I think I had this or something similar when I was in HK, and now I have the recipe - what a great souvenir. My mum also likes to stir fry leftover roast pork with sugar, dark soy sauce to refresh the taste. Never thought of eating them with porridge. Great idea. How long have you been in HK? What a yummie looking meal!! I love it! Love your comments, really good news for me. Thanks so much. You and your husband are very fond of homemade Chinese food. That's great. I'll share more on this blog. 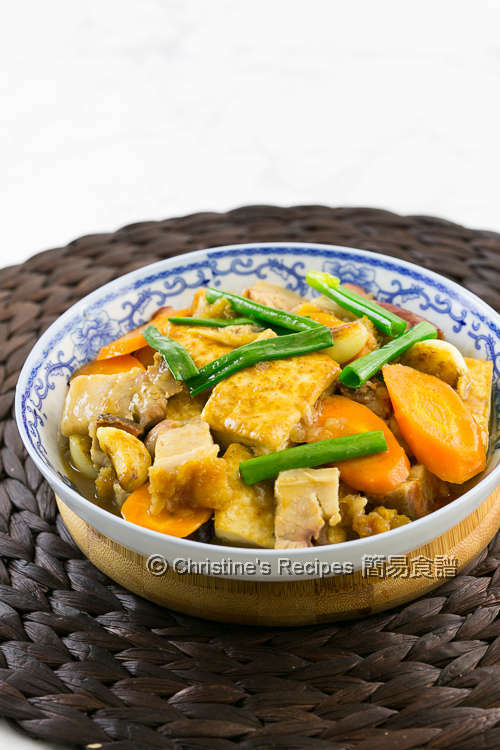 You'll find Chinese cooking is very easy and yummy. The ground bean sauce is quite unique. Can't find anything can replace it. It's a very common sauce anyway. Try Asian grocers nearby. Or some supermarkets might have stock too. Wow - I've just come across this recipe and your blog! My mouth is watering! Just hoping someone could confirm for me - when you say shallots do you mean small brown onions, or the little ones with the long green stems? Thanks in advance! The shallots look like small brown onions, not the long green ones.